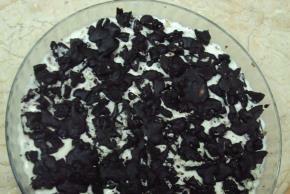 Crush 1 1/4 packets of Oreo Cookies and set them in a dish with the help of butter and freeze it to set. Now take a bowl and put Cool Whip and condensed milk in it and whip. Now put this batter on the cookies and put walnuts in this batter and again freeze it. Now make small pieces of another 1/4 packet of Oreo Cookies and spread it over the batter. Now melt the chocolate and spread it over Oreo pieces and again freeze it. When it is set, enjoy your chocolate walnut delight.